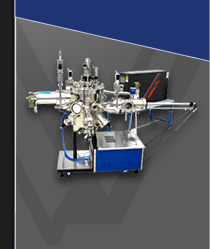 The SVT Associates' Atomic Hydrogen Source is typically used for substrate cleaning, for example in III-V MBE Systems or II-VI MBE Systems. It operates on the principle of electron beam heating. This UHV compatible source can produce temperatures up to 2600° C. Hydrogen gas is introduced and thermally as well as catalytically cracked to produce atomic hydrogen with high efficiencies. An integral flux monitor allows replication of operating parameters. The source mounts on a 2.75" or 4.50" CF flange.